Bracket Event - 22nd May 2010 - Willowbank Raceway. First pass my reaction was .049 running 11.64 seconds over the quarter mile. Then a cherry...oops! with the car having an 11.67 pass and maybe not warmed up enough, hence the slower time. The next was a .019 light with an 11.61 and the last qualifier saw me with a .076 reaction and 11.60 pass. .070 .061 .003 then a bye run and in the final I had a .092 reaction. Not real great reactions but good enough to get me in the final. On the bye run the Rover ran an 11.51 pass. Both Warren and myself thought this a bit unusual, so we dialled-in 11.57 in the final run. We really didn't think the car would have pulled another 11.51 out of the air...when, "holly molly" what does it run an 11.50. I claimed the Runner-up position which, I believe, now places the Mama's Toy Racing Team in 3rd Place in our Track Championship with one event to go till end of season. Also still sitting in 4th Place in the National Championship having one event to go. Next meeting is the biggest drag racing event on the Australian calendar...THE CASTROL EDGE WINTERNATIONALS 10th -13th June 2010. Venue: Willowbank Raceway, Queensland, Australia. Qualifying for us commenced on the Saturday around 12.30pm seeing the Rover run 11.66 over the 1/4 mile. Three qualifying runs were scheduled for this day but only two eventuated. Our second run was an 11.64 second pass. Early Sunday morning saw our last qualifier at 8 am where mama ran 11.65 seconds. the Track and Australian Championships. pass over the weekend. Big congrats to these girls! Only a short review and that sums it up for now...until next time. Setting out on Friday 19th February for our trek from the east coast of Australia to the west coast to compete at the 39th Annual Westernationals ANDRA PRO SERIES drag racing event. 7 in the bus, 2 in the transporter and 5 flying over. Upon leaving Ipswich I really wasn't sure we'd make it out of town with all the gear crunching going on and the bus stopping a couple of times. Finally on our way we met up with the boys in the transporter carrying the three race vehicles. Trev's 63 Jaffa Cortina, Col's 64 EH Holden and Terri's Mama's Toy Rover. Whole wheels flying off the transporter and would you believe the bus door blew off but was caught and eventually put back together with 19 screws, 100 MPH race tape and for extra security a pair of thongs jammed between the door and an aerial pole. WAY TO GO BOYS...WHAT A FIX! We set up at the track in very hot, wild and windy conditions only to come back the next day to find Trev's pop-top damaged by the wind and un-usable. There was two qualifying sessions on the Saturday and one on Sunday. I dialled in 11.65 and ran 11.65 but was out-reacted and lost, so we became spectators cheering on our fellow racers from Queensland. Col Murray won his first round and then was paired up with Trev Davis who won the race. Trev went on to win our Super Street bracket and received the coveted ANDRA gold Christmas Tree trophy. A very big congratulations to Trev and his crew for a great performance. New friendships were made during this trip and what a great bunch of characters to travel and race with. 3rd Place in the Willowbank Raceway Track Championship with four meetings to go till end of season. The day commenced for us at 8am with very cloudy conditions with the forecast of showers. Super Street had 3 qualifying passes the first being at 10.11am then 12.27pm and 2.19pm. Rain held up proceedings for at least 2 hours which then led our bracket to have their first round of racing at 10.08pm. The Mama's Toy Racing Team managed to get to the SEMI-FINAL which now places me in 3rd place in the Willowbank Raceway Track Championship with five rounds to go till the end of the season. A big congrats to Willowbank Raceway for seeing the meeting right to the end through trying times with the downpour. I'm sure like us the other racers would have been very pleased that the organizers of this event saw fit to continue on and finish the meeting. Benaraby Raceway had their end of season drag race meeting on 28th November with a Test'n'Tune format the night before. Mama, Warren, some of the crew and friends decided to make the 7 hour trip to have some fun and compete at this event. Conditions on arriving at the track both days was very hot and dusty. We had four runs of the Friday night with the first pass being rather hairy. Lots of wheel spin off the line and I was wrestling with the steering wheel trying to keep the old girl, (not me, the Rover - lol ) headed in a straight line. Benaraby's tree reads in .4 of a second and my first reaction was a red light. Racing for us commenced at 6.40pm with it being CHICAGO SHOOTOUT racing which means 3 races to determine who's in the final. We dialled in 11.76 in the first round of racing with a .482 to my opponents .678 reaction and mama being the winner. Second round and I'm up against Australia No1... Paul Dilley. We dropped the dial-in to 11.71 and ran 11.75 with a .487 reaction to his .543 and again mama was the victor. I had a BYE in the third round as the other racer I was to come up against (James O'Sullivan) destroyed his engine at the finish line on his last pass. Because of this style of shootout even though I'd just won 2 rounds of racing this last run would be the decider as to whether or not I'd make the final. The rule to win this round was not to red light or breakout. I aired on the side of caution with my reaction and waited for the lights to come down and had a .594 and ran 11.76 on my 11.73 dial-in. The whole team was just rapt that we made the final. I found the track itself to be rough in the right hand lane, especially mid-track, however manageable and I enjoyed racing immensely. I also had the opportunity to have a chat over the PA System with the commentator as did other racers and the atmosphere at Benaraby Raceway was absolutely fantastic. The meeting was run extremely well by the organisers and everyone so friendly, to the extent that we would not hesitate on travelling again next year to compete. Congratulations to Benaraby Raceway for a great meeting! This Bracket Event was rather interesting to say the least! After arriving at the track and unloading the race vehicle etc, I then headed to the scrutineering bay to hand in our entry form, only to be told no paperwork would be accepted yet due to a minor fault with the Christmas Tree lights. The third amber light was not working and the problem couldn't be fixed on the day. Track management did decide to go ahead with the meeting but no points would be allocated towards the Track Championship only trophies given to the finalists. Racers were also given the option of having their entry refunded if they wished to leave and not run the meeting. The heat was soaring and after my first qualifying pass I noticed on the way back up the return road that one out of three heat gauges was winding itself off the clock. I pulled over to check under the bonnet. Fans still working, no gurgling coming from the radiator and no signs of any other malfunction. I sat for a while to let the car cool then drove back to the paddock area. After inspection it seemed the gauge was at fault. I lost by two thousandths of a second in the first round of racing. OH WELL! There's always next time. Track management had a minute silence for the sad loss of fellow racer - Darren Shepherd who was tragically killed in Sydney recently. As a show of support the bike riders and their crew all grouped together at the top of the lanes. However some racers did achieve good reactions and CONGRATS to those who made the final. Our Mini-Field of Women event was in doubt at first as it looked very much like rain from the previous two days was to continue into the weekend. This event was to be held in conjunction with Willowbank Raceways, Havoc Print & Sign Street Series with the gates opening at 2.30pm. Mini-Fields are designed to pay tribute to women who have suffered from breast cancer and the planting of 100 Pink Lady Silhouettes serves as a display of support for these women and their families. The weather was kind and the event a huge success. I decided once again to sell Breast Cancer Network Australia merchandise and the outcome to this was astounding. On the day we raised $600, which in turn brought our total to $1500. Prior to this we campaigned for breast cancer awareness with the selling of merchandise at the recent Sunstate Nationals at Palmyra Dragway, Mackay and the generosity of the many people was enormous to say the least. The whole idea of Mini-Fields is to pay tribute to women who have suffered from this disease, but by selling the merchandise this in turn helps to make others breast cancer journey just that little bit easier. I'd like to thank the Palmyra Drag Racing Club for their support and a huge thank you to the racers and their crew who attended this event and gave so generously. Thank you to Willowbank Raceway for enabling our Mini-Field to go ahead. Thank you to the Meeting Director - Peter Duffy. the commentator -Chris Diggles for his support during the day, the officials, racers, spectators and of course my helpers on the day. Daughter - Janine for her massive effort. LOVE YOU HEAPS! Friends - Debbie Mackay, Gill Johnson, Georgina Atkinson. Mama managed a Semi-Final appearance at this Bracket Event held at Willowbank Raceway. I was shocked to get this far as I believe my reactions were mostly horrid. However a win is a win. In the second round I did have a good .041 reaction to take the win. Third round saw both my opponent and I with identical reactions but once again mama came out the victor. Semi-Final and I pull a red light. I an now tied on 2nd place, with one young gun, in our Super Street bracket for the Track Championship. I am also currently leading the Australian Championship in our bracket. Mama is really hoping this season's results will provide me with a championship win. Come join us at the track! Our journey began at 6.20am Wednesday 30th Sept with Warren and I heading north to Mackay, 1000 kilometres, to compete at the Sunstate Nationals and burn some rubber. The first day was to end once we reached Gladstone for an overnight stay with our granddaughter Caitlyn, daughter Janine and her partner Ross at his home. We were going along great guns until the inner-city bypass where we hit bumper to bumper traffic that led to an arrival at Gladstone around 2.30pm. Departure from Gladstone was at 8.30am the next morning passing three really neat looking Hot Rods travelling in the opposite direction along the highway. Quick stop at Rockhampton for fuel and pick up subway for lunch. Our amusement for the next 350 kilometres was the colourful language heard over the CB radio and music, arriving at Mackay 3.10pm. The countryside was as dry as a bone and the creeks we passed along the way, were either dried up or those that had a small amount of water looked very murky. Once we reached the sugarcane fields this area appeared green. The paddock area at Palmyra Dragway, Mackay was hot, dry, windy and extremely dusty. We had 3 runs on the Friday night with the race car running all over the place. TIMES: 11.67 11.75 11.85 not at all it's consistent self! 11.75 11.72 and 11.89 with the Rover wheel spinning due to track conditions. Again we disregarded these runs and now not enough data in the weather station to predict our runs accurately, so Warren and I went back to our old method of picking a dial-in by checking the humidity and relying on our knowledge of the car's previous performances. Out comes the practice Christmas Tree to help sharpen my reactions for racing knowing this could be crucial. With a relatively small field of only 16 cars and 4 rounds of racing to the final and being seeded from round one, I was lucky enough to be up against last season's Australian Champion and winner of this event two years ago. I left with a clean green light and my opponent pulling a cherry thus giving mama the win. Our dial-in for round two was 11.72 and again I'm the slower car and cut a .053 reaction to my opponents .101 and backed off to run 11.75 with another win. Semi-Final and I'm up against twice winner of this event. Again mama's first to leave the line with a good .031 to a .097 again backing off to run 11.77 on an 11.72 dial-in for the win. Into the final against the current Super Street Champion and the winner of this event last year and I cut a .088 light, not great but better than my opposition. With almost .1 advantage I backed down to run 11.77 on my 11.73 dial-in for the win. The girls were on fire at this event with a Supercharged Outlaws win for Christine Steffans, mama in Super Street and two in the final of Junior Dragster. 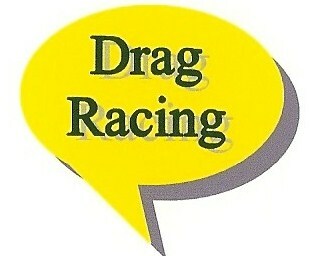 With over 140 entrants this was the biggest Sunstate Nationals event for Palmyra Dragway to date and a huge success. Congratulations to all the finalists at this event! I would sincerely like to thank our daughter Janine and granddaughter Caitlyn for their mammoth effort at this meeting with our Breast Cancer Network Australia awareness campaign. A huge thank you to the racers and their crew who showed their support as well. It was very much appreciated! And to my wonderful husband Warren for trekking up north once again.